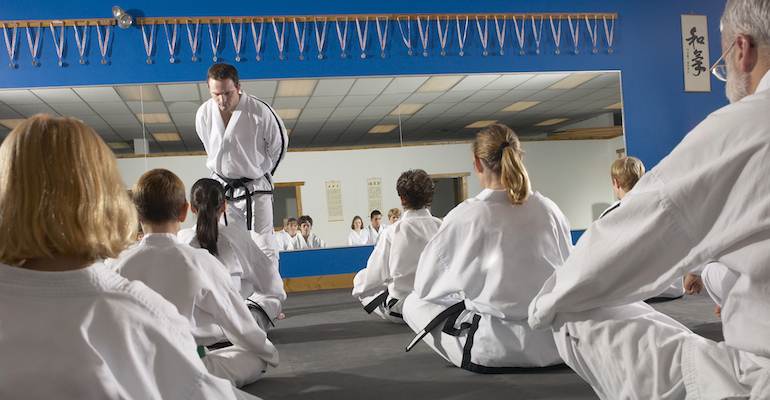 “Why do you want to study Tae Kwon Do?” Master Park examined my face closely, as if to find the answer in my expression rather than hear it from my lips. “Uh-huh.” Master Park continued to scrutinize me — he knew that there had to be another reason. Finally, unable to gin up any additional pseudo-explanations, I hesitantly offered the main motivation for my interest in the sport. “Also, Tae Kwon Do is Korean. I am interested in things that are Korean right now because my husband and I are in the process of adopting a baby girl from Korea.” My voice was almost apologetic. “Ah!” Master Park’s face lit up. His potential pupil had finally revealed her heart! He proceeded to ask me a series of polite, interested questions about the child we would be adopting, and then we shared stories about our own toddlers. Later, when I was alone, I wondered why I had been so reluctant to reveal the true nature of my interest in Tae Kwon Do. Was I intimidated by Master Park? It would have been understandable — I had read his biography before meeting him. He had once been a Special Guerrilla Military Trainer to South Korean army officers. It was reasonable to assume that he could, with little effort, kill me with a couple of his fingers if he was so inclined. But his demeanor had been completely amiable — despite his apparent mind-reading abilities — and he had given me no reason to be nervous in person. So why had I been so reluctant to tell him about our pending adoption? As I relayed this story to my husband, it occurred to me that this incident was not an isolated one. In Korean markets and in conversations with individuals of Korean descent, I frequently hesitated to tell people I was adopting a Korean baby. “Why?” I wondered aloud. But I realized the answer even as I posed the question. As a white, Jewish American, I feared Koreans would judge me harshly for reaching across the geographical, racial, and cultural barriers that separated us and making one of their children my own. I traced the genesis of my anxiety back to a conversation I had had a few years earlier with a coworker, a Korean-American woman in her early twenties. I was pregnant with my now three-year-old son and I had mentioned that my husband and I were contemplating an international adoption from South Korea at a later time. “Oh, my mom HATES that!” Her eyes widened to emphasize the depth of her mother’s antipathy. “Hates what?” I replied, confused. “Why?” My curiosity was piqued, though I listened with apprehension for her response. I didn’t want to continue the discussion because I sensed that we were spiraling into an argument colored by intense personal feelings. I ascribed her mother’s feelings to ignorance, and perhaps even subtle racism, and I gave it little thought after that. Yet, several years later, as my husband and I began to think about international adoption more seriously, my former colleague’s words continued to haunt me. We were enthusiastic about the cultures and adoption procedures of several countries, but many factors weighed in favor of South Korea. These included the relative health and young average age of the babies, and availability of medical information. But doubts gnawed at me. What if the Korean people I encountered looked upon me with scorn for calling a Korean child my own? Far worse, what if my daughter, when grown, was rejected as not a “real” Korean because she had been raised by white, American parents? I could not pursue a Korean adoption until I investigated further. I began my research on the Internet, and was not reassured by what I found. I learned of the embarrassment experienced by many Koreans who felt that their own social conventions, which disapprove of adoption, had led their country to “export” babies to the United States. This feeling of humiliation reached its zenith when Seoul hosted the 1988 Summer Olympics. The world focused its attention on South Korea, and the media ran stories about the large numbers of Korean adoptees who returned to their homeland for the games. Wincing from the glare of a global spotlight, the Korean government sharply curtailed international adoptions thereafter. Discouraged by my findings, I decided that I needed some first-hand insight from Koreans or Korean Americans. I turned to a former college housemate who had emigrated from Korea with her family at the age of five. Though Jill seemed as “Americanized” as anyone I could think of, I knew that she and her Korean-American husband, Dave, were firmly grounded in Korean culture. Years ago, Jill had introduced me to the fiery properties of kimchi and the simplistic yet comforting texture of sticky rice, and I knew that I could go to her with my questions. Jill and Dave spent almost an hour with me on the phone. They stressed that views regarding adoption are evolving in Korea and in the Korean-American community. Dave was firm in his opinion that the negative views of adoption ascribed to Koreans rest primarily in the eldest demographic. He believed strongly that, by the time my daughter reached adulthood, there would be little stigma left for a Korean child adopted by white parents. My husband and I met next with Reverend Kim, a local Korean minister. His enthusiasm for our adoption plan was wholehearted, and he confirmed the value of our intention to seek out Asian role models and families of mixed race so that our daughter would be exposed to people who looked like her and families that resembled ours as she grew up. My husband and I made our decision that day. We knew that, if we were willing to face any challenges that would arise from a transracial, transcultural adoption and simply be the best parents we were capable of being, our daughter would likely become a happy and confident young woman. So why did it make me nervous to tell Master Park that I want to take Tae Kwon Do because I am adopting a baby from Korea? I still don’t know the whole answer to that question. Maybe I seek respect from the people who will share my daughter’s birthright. Perhaps I fear the sting of racism from another people, or maybe I am reflecting a hidden unease of my own. It might be that I am simply concerned for my daughter-to-be’s future, or maybe it is a combination of all of those factors. Though others have gone before us, no one can tell us whether the journey that awaits us will be populated by resentful Korean mothers or by approving Master Parks. I only know that so far, each step I have taken into my future daughter’s world has taught me nearly as much about myself as it has about her culture. Maybe understanding and facing oneself is one of the complexities inherent to any adoption, and this child, in a way, will have nearly as much of an influence on my development as I will have on hers. As we begin to travel this unnerving yet enticing American-Korean-Caucasian-Jewish-Asian road of our life together, I can’t help but feel that I have already discovered one of the myriad challenges and wonders of international adoption. “Keeping Up Appearances” – Our Skin and 4C Hair Care ..
As the parents of four black children, we drop a ..